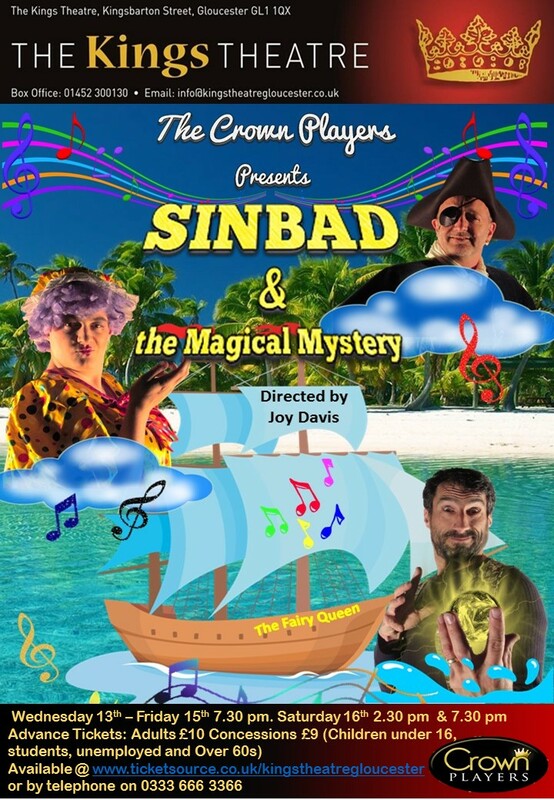 "SINBAD AND THE MAGICAL MYSTERY"
Dragunda, the meanest and mightiest magician in the world, is looking to rule the universe but to do so must obtain three different feathers from three different birds on three mystical islands. However, only someone honest, pure and true can undertake such a task which is where our hero Sinbad comes in. Dragunda kidnaps Princess Yasmin and will only release her when Sinbad has captured all three feathers. Along the way Sinbad, his mum Mrs Sinbad, Cap'n Pugh and his crew (who bear more than a passing resemblance to the Teletubbies) encounter adventures on the Isle of Juven, No Man's Land and Oomagoolee Island. Come along and join the Crown Players for frolics, fun and loads of Beatles songs. This is a panto for all of the family to enjoy.